Have you heard of a “Busy Bag?” It is an activity for your child that you can store easily in a small bag and pull out for your child just about anywhere when you want them to be doing something productive without your assistance. 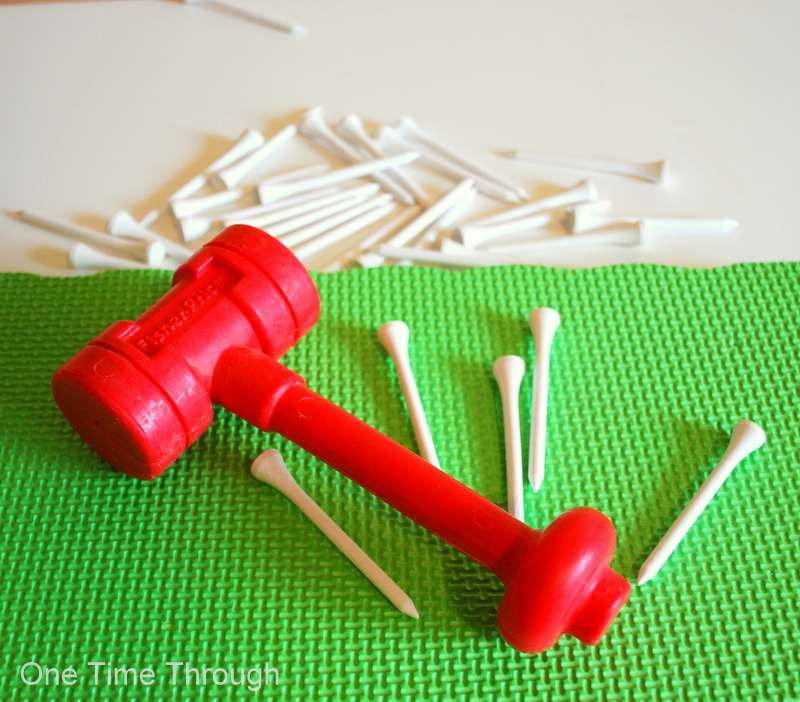 Today’s post shows you how to make a fun busy bag that works on fine-motor skills and uses a play hammer and “nails.” It is appropriate for kids aged 2 to 4 and adaptable to your child’s learning needs. Before I tell you how to set up this busy bag, I wanted to let you know that this post is part of the Virtual Busy Bag Exchange Series hosted by Teach Me Mommy. It is a week-long exchange of busy bag ideas for a variety of ages of kids by a bunch of awesome bloggers. Young kids LOVE doing the things that Mom and Dad can do – right? That’s what gave me the idea to create the Hammer & Learn Busy Bag activity. Onetime (my 2.5 year old son) really enjoys playing with tools and always wants to “help” when Dad is doing a project around the house. I happened to have a gardening kneeling pad lying around and had picked up some golf tees for another craft when Onetime grabbed his hammer and started working away by himself trying to hammer the tees into the foam! At first he couldn’t quite get the golf tee “nails” in by himself, so I showed him how to hold the tee with one hand and hammer with the other. Then he spent quite a few minutes trying by himself. After a while of letting him struggle, I did a little “hand over hand” prompting where I held his fingers onto a golf tee, while he struck with the hammer. After he got the sensation of how to hold the tee still while hammering, I stopped helping him. He got the skill fairly quickly and then had a blast hammering all the “nails” into the board. Being a teacher, I tried to think of a way to enrich the activity and so I wrote some words on the foam pad for him to hammer into. We started with his name and then a couple of words of things he likes. On the corners of letters, I drew little circles for him to aim for with the nails. Onetime really enjoyed this and over the course of a few days, got very good at getting his nails into the targets. Soon I bought more foam pads and wrote all kinds of things on them using permanent marker. On one, I wrote the alphabet. On another, I put numbers to 20. On others, I put words and names of people my son loves. On another I drew some shapes. The possibilities are endless and completely customizable to each child. 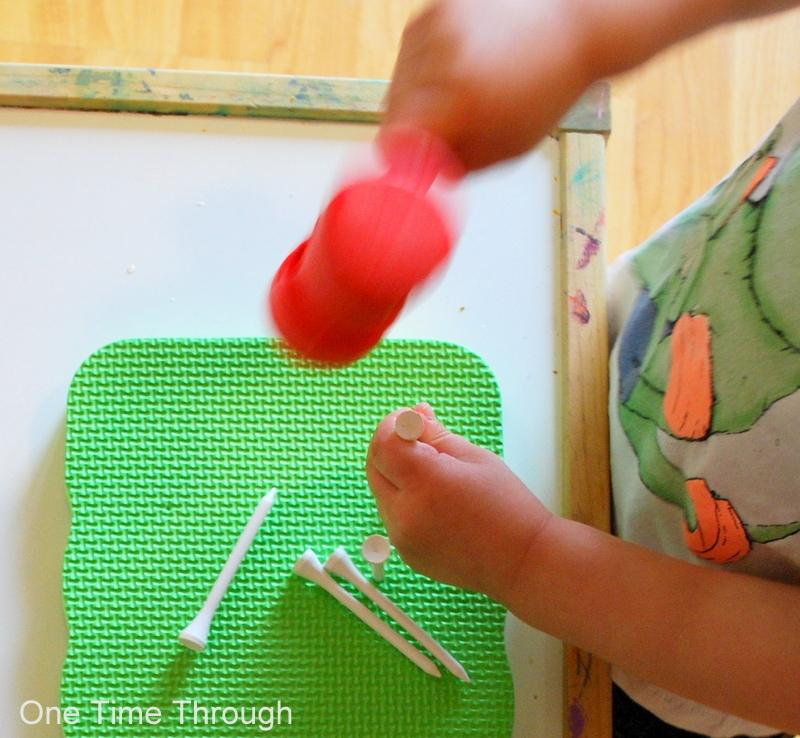 What initially started out as a fine-motor activity that works on the pincer grasp (holding the tee still is very similar to holding a pencil for writing), soon became a learning activity. When my son works on hammering in his nails, he is also paying very close attention to the shapes of the letters and numbers he is working on. 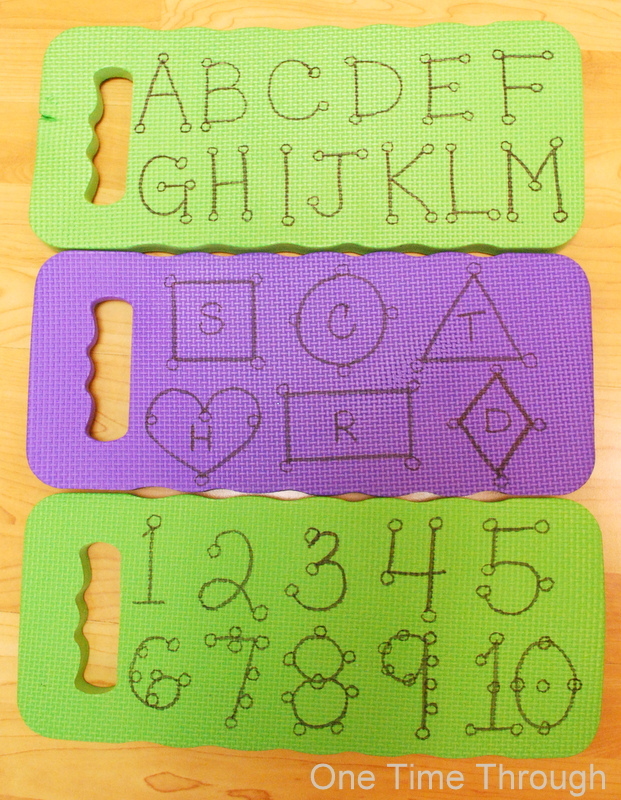 This activity can be done completely independently, or even better, with an adult who is reading and talking about the letters/words/numbers/shapes on the foam mat. Once the targets are all “nailed in,” the tees can be removed and the mat can be used over and over again. As an option, words/numbers/shapes can be written on a piece of paper that is then nailed on top of the mat and used as a target. To make your Hammer & Learn activity fit in a bag, just carry the foam pad by its handle and pop the hammer and tees into a bag. Alternately, you could cut the foam boards in half and fit about 5 of them into a large Ziploc. 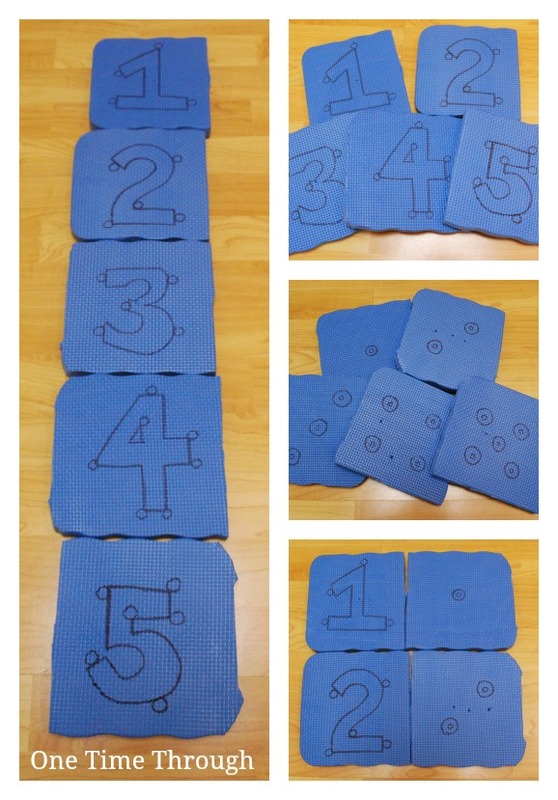 Here is an example of a numbers-based busy bag with 5 foam pieces. On one side of all 5 pieces, write the numerals from 1 to 5 and add targets. On the backside of these pieces, draw corresponding numbers of dots. Make sure to NOT put the corresponding dot on the back of its numeral. For example, do not put two dots on the back of the mat that says “2.” Put them on another mat. That way your child can match up the numeral mat with the dots mat. When drawing on the dots, I used the layout of dots that you find on dice. It’s good for kids to learn these arrangements so they can quickly recognize these numbers as they get older for dice games. 1) Practise ordering the numerals from 1-5. 2) Match each numeral with the mat that has the same number of dot targets. That’s it for the Hammer & Learn activity, but as a part of the Virtual Exchange, there are 3 other bloggers who are posting busy bag ideas today for preschoolers. Please check them out for even more ideas! We are also featuring a Linky today for Busy Bag ideas for 3-4 year olds. If you have a great idea – LINK UP and be sure to check out everyone else’s ideas! 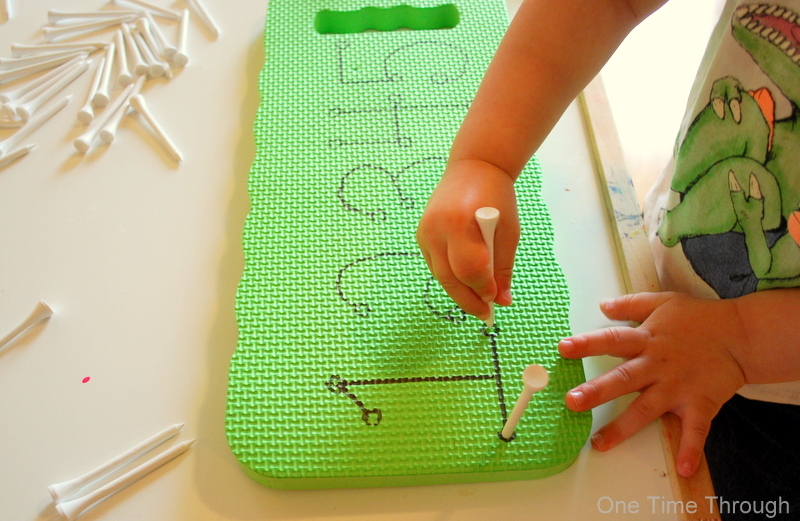 Follow One Time Through’s board Fine Motor Activities on Pinterest. 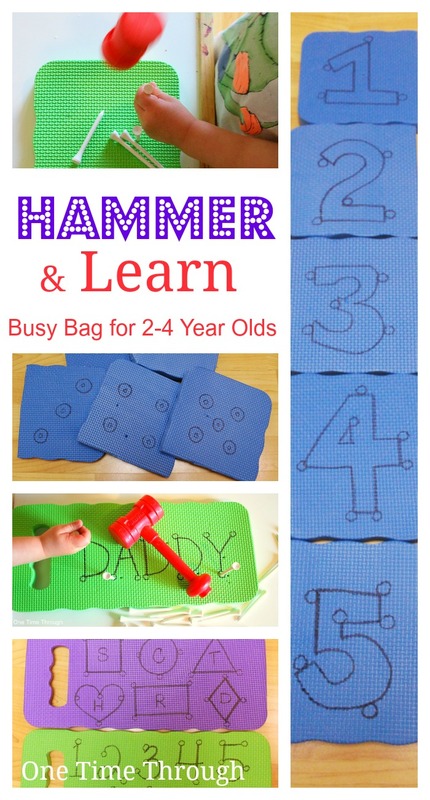 Thanks for dropping by and hope your little one has fun with the Hammer & Learn activity! Great post Sue! I love how he learns while burning some energy off too! Will work for my kiddos too! Thanks for participating in the series! What a great idea! 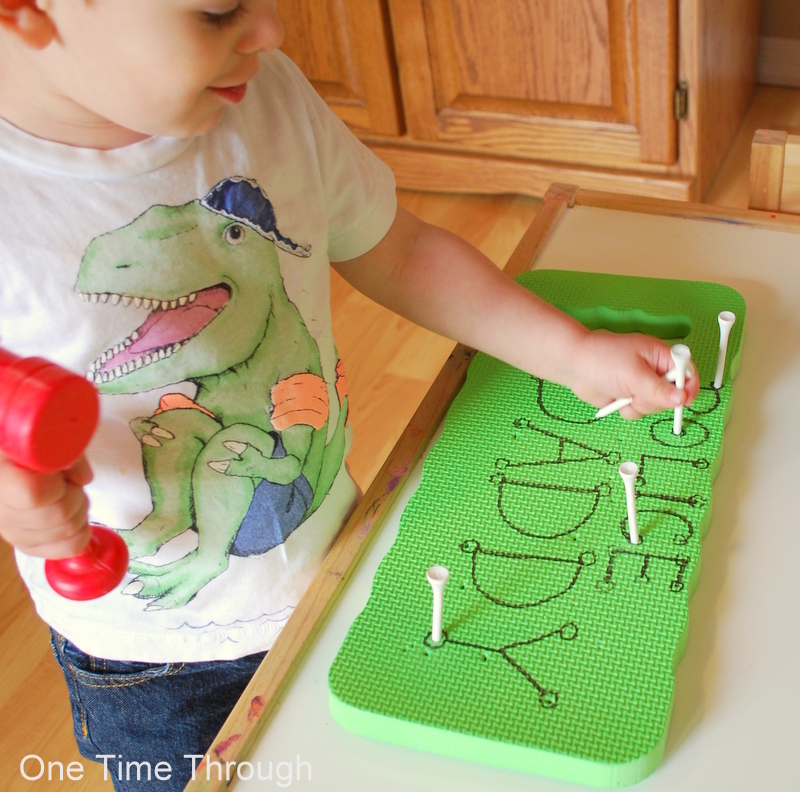 My daughter loves hammering things and this can be used for anything – numbers, letters, sight words, etc!